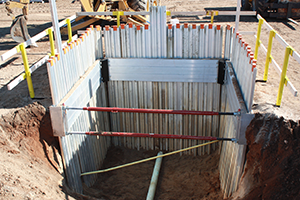 The Aluminum Sheeting Guide, built by GME, is designed to be used by rubber tired backhoes and lightweight excavators. The GME Aluminum Sheeting Guide solves the problem of how to safely shore around existing & crossing utilities on job-sites! Unique keyed locking pin requires no keepers--so it's faster and easier to use, with fewer parts to lose. The screw jack strut features a shallow square thread design and is coated with a special rust inhibitor which wipes clean with a rag, for smoother performance. Able to be used on projects with crossing and existing utilities are present.